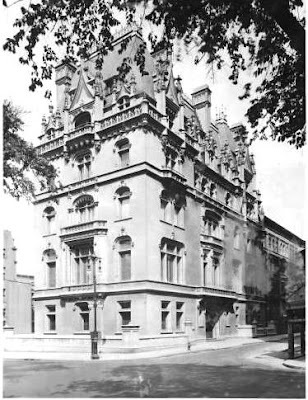 Therefore, when Jacob Schiff’s son-in-law Felix Warburg began planning his grand French Gothic palace on the corner of 5th Avenue and 92nd Street, a block from Andrew Carnegie’s mansion, Schiff objected. Fearing that the ostentatious style would spur anti-Semitic criticism, he urged Warburg to build in the more restrained Italian Renaissance style. Felix and Frieda had admired the Francois I style mansion of Isaac and Mary Fletcher designed by C. P. H. Gilbert in 1898. The couple commissioned Gilbert, known as the architect of mansions, to design a similar, larger and grander residence on a plot purchased from Perry Belmont. Following the couple's general design direction, Gilbert also drew inspiration from the Hotel de Cluny in Paris. Begun in 1907 and completed a year later, it dripped with Gothic moldings and boasted ogee-arched windows, steep slate mansard roofs and crocketed gables, tall chimneys and foliate borders, tracery and copper cresting. Unusual in Fifth Avenue mansions, a 50-foot side lawn fronted the avenue. ﻿ The Warburgs’ limestone chateau featured a grand entrance hall with an enormous staircase. On the first floor were a small gallery for the collection of early German and Italian woodcuts and Rembrandt etchings, and the kitchens and pantries. 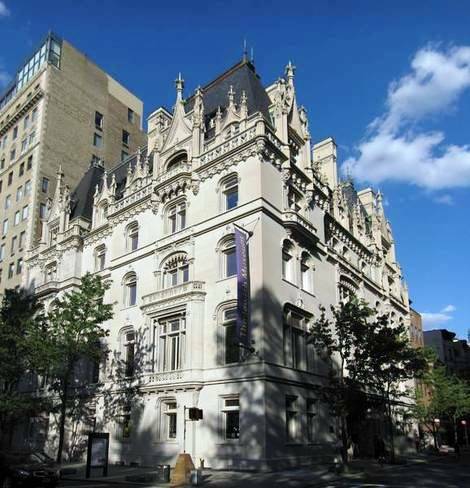 The second floor held a music room overlooking Fifth Avenue with an Aeolian pipe organ and some of the Warburgs’ art collection – tapestries, illuminated manuscripts and sculpture. A stained glass conservatory housed a Botticelli while an adjoining room displayed a Madonna and Child by Raphael and antique Italian paintings. The formal dining room, hung with medieval tapestries was also on this floor. Above were the family rooms: the master bedroom, Frieda’s boudoir and dressing room, and joint sitting rooms for the parents. The fourth floor housed the five children’s bedrooms and the fifth held guest bedrooms and a squash court. And indeed the children had fun. A train wound its way throughout the children’s bedrooms and Mrs. Walburg’s china bowl in the entrance hall, meant for receiving calling cards, was a perfect target for spitting contests from the staircase landing above. There were 13 servants living in the house including a nurse and an engineer. The family lived happily at 1109 Fifth Avenue until one-by-one the children married and left. In 1937 Felix died, leaving a legacy of generous philanthropy. Frieda stayed on in the house, kept company by the family of Max Warburg who were driven from Germany by the Hitler regime. Things were changing on upper Fifth Avenue though. 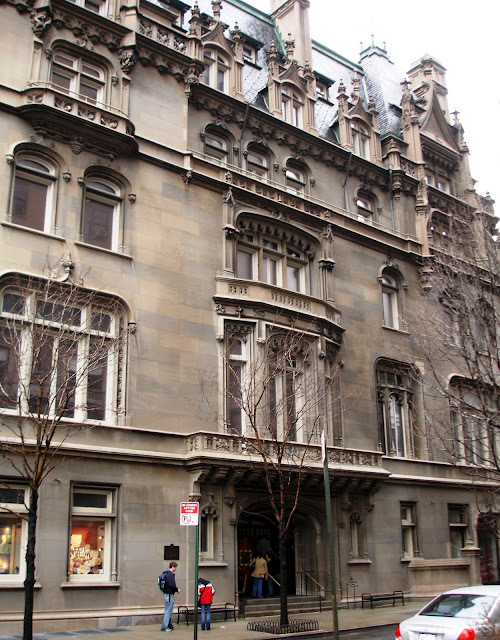 On May 3, 1940 Frieda Warburg leased a duplex suite covering two full floors in the apartment building at 1070 5th Avenue. Property taxes on the house, totaling $665,000 a year, coupled with operational expenses and maintenance made sustaining the building infeasible. Within a year she emptied the house, donating the bulk of the rare artwork and furnishings to museums, libraries and universities. Three years later she donated the house to the Jewish Theological Seminary for its Jewish Museum which opened to the public in 1947. In 1963 the side yard was replaced by a new wing. Frieda may have moved in early 40's, but I was a visitor to the family in the mansion in 1946/7, and Warburgs still lived there, and also had the apartment across the street, with, as I remember it, a private elevator from the street, where there is a drive in the building just off fifth Ave, and doctors'entrances now. thanks for the very interesting information!